Fair warning, I am about to horrify everyone of Italian descent and anyone born south of the Mason Dixon line (except my mother who doesn’t like grits and therefore doesn’t care). Polenta and grits are the same thing. I know, I know, I’ve just committed some kind of heresy, but that doesn’t make me wrong. Don’t believe me? Let’s analyze this. Polenta and grits are both made from cornmeal. It can be a fine grind, or a coarse grind. Polenta’s generally made from a yellow cornmeal, while grits are usually made from a white cornmeal, but still all just cornmeal. If I used blue cornmeal would I have to call it something else again? 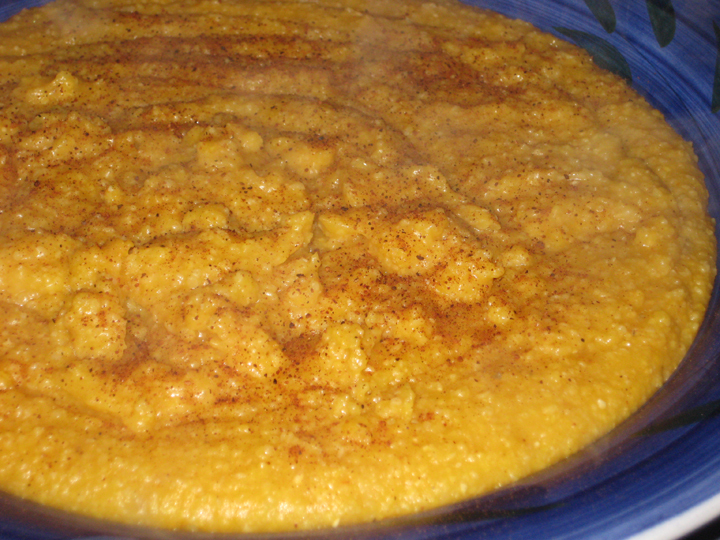 Polenta and grits can be served hot and spoonable, or they can be chilled, sliced and fried or baked. Polenta and grits can be served plain, or with the addition of egregious amounts of cheese – usually parmesan or goat cheese for polenta and cheddar for grits but these are variations on a theme, not fundamental differences. 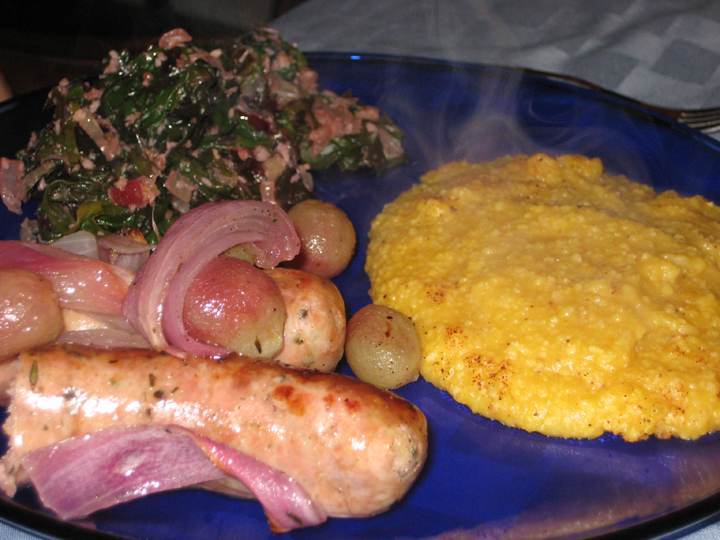 Polenta and grits can be eaten for breakfast, lunch or dinner. They can be rustic country food – in the case of grits something no Southern diner worth its name would think to leave off the menu – or they can be something you’d pay a lot of money for when made someone called a chef instead of just a cook. Most importantly – and this is the bit that I wish I’d been able to ascertain for certain last week – they’re cooked by exactly the same method. It’s a ¼ cup of cornmeal whisked into 1 cup of liquid and then cooked at a low simmer for 25-30 minutes, stirred frequently. You can use water, or chicken stock, or milk, or cream or heavy cream, or any combination of the above as your liquid so long as you preserve the 1:4 ratio of cornmeal : liquid. Personally I like to make my grits with ½ water and ½ milk and add a (generous) pat of butter at the end, while I’m more likely to cook polenta in a mixture of water and chicken stock and add parmesan and butter at the end. But this is semantics and mostly about the fact that I’m eating the former for breakfast (or at least breakfast for dinner) and the latter for dinner (for dinner). I would go so far as to say that the only difference I can discern between polenta and grits is the culture that claims them, and the fact that polenta has managed to acquire a mystique to it, while grits remain a regional comfort food. Although having said that, the South is rising again in culinary terms and more and more of the best restaurants and new cookbooks are embracing/elevating Southern cooking, so maybe a year from now grits will be the new polenta. I just wish I’d realized that polent and grits are exactly the same thing last week before I spent several days of increasingly baffled googling trying to figure out exactly how one cooked polenta. I found cooking times that varied from 15 minutes to over an hour, and recipes that abjured to you stir constantly and others that allowed you to stir every so often. I ended up doing a test run on Sunday to figure out the answer. This wasn’t the end of the world or even really all that inconvenient because I was in the kitchen anyway doing other things – but was somewhat redundant since as it turns out polenta = grits, and I already knew how to make grits. To which I say, amen, and it’s tasty no matter what you call it. This is a variation on the roasted sausages I’ve made previously. 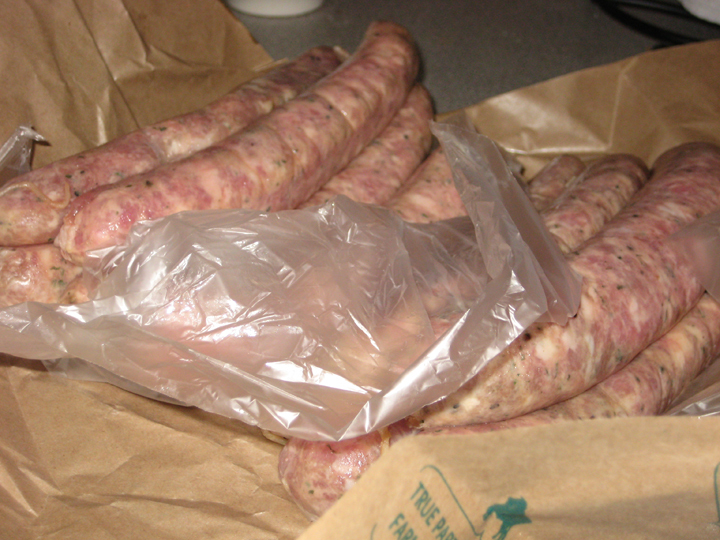 Bring a pot of water to a boil and simmer sausages for 7 minutes to remove some of the fat (this step is optional). Pat dry. 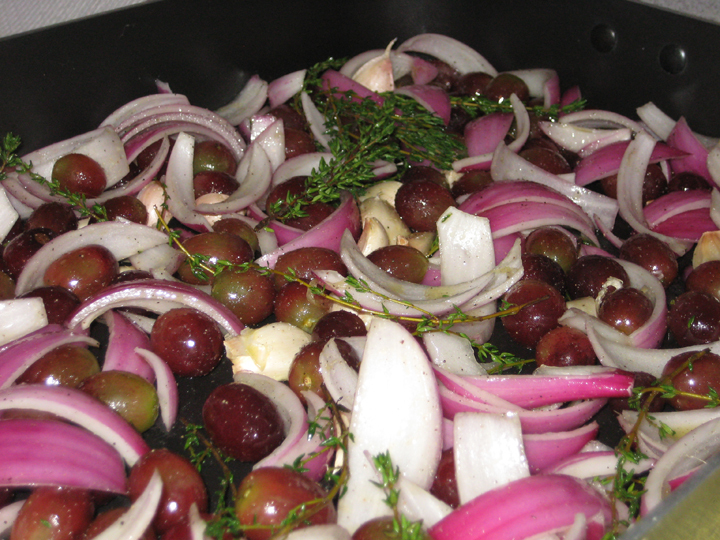 Toss the sausages, onions, garlic and grapes with salt/pepper, thyme with just enough olive oil to coat and arrange in a large casserole or roasting pan, or on two baking sheets, making sure that the sausages are touching metal (otherwise they won’t brown)*. Roast for 25-30 minutes, turning once. 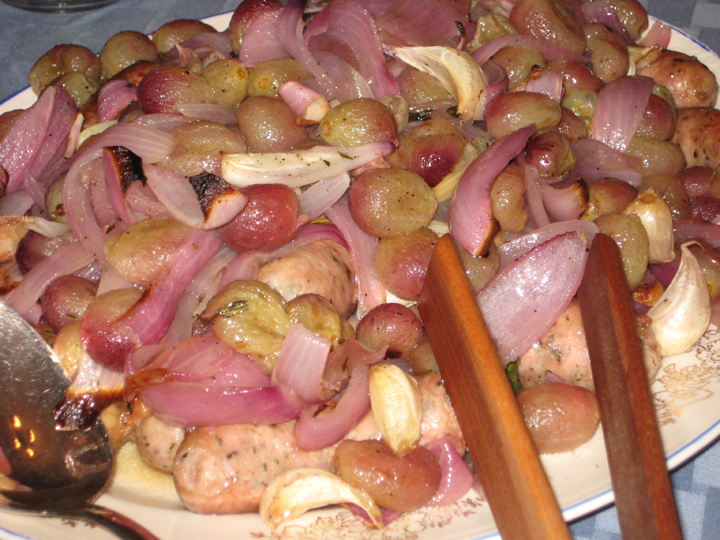 You can serve as is, or you can reduce the pan juices on the stove top until they are thick and syrupy and pour over the sausages/onions/grapes. * The trade off on casserole vs. baking sheet is that the casserole helps keep the sausages from drying out but prevents the onions from caramelizing, while the baking sheet will caramelize the onions but frequently overcooks the sausages. Whisk together water, chicken stock and pumpkin (you can use all water – I wouldn’t recommend all chicken stock it’s too overpowering and you don’t taste the pumpkin) and bring to a boil. Slowly whisk in the polenta in a steady stream (if you get lumps at this point you might as well just start over because you’ll never get rid of them). Whisk mixture until it is smooth, return to a boil, then reduce to a simmer and cover. Cook at a low simmer for 25-30 minutes, whisking vigorously every 5-7 minutes. When the polenta has thickened and cooked add the parmesan and butter. Whisk to combine, and season to taste with salt/pepper/nutmeg. Either serve immediately, or pour into a greased dish and allow to cool. Chill overnight, then turn out, cut into slices and grill or fry in a little butter/olive oil. * For the record I used Bob’s Red Mill “Corn Grits also known as Polenta”, but I suspect regular ole yellow Quaker cornmeal would have worked just fine. The grits/polenta are just a slightly coarser grind than standard cornmeal. Back in May I made Spiced Coconut Spinach (with Asparagus). I’ve made a lot of variations on this recipe since then, and at this point it’s so amended that it’s no longer really the same recipe. You can make this with pretty much any dark green – although I wouldn’t recommend baby spinach which is a little too fragile for this application. I used chard this week because chard is one of my favorite of the dark greens. It’s got a little more heft than spinach, but it’s not as dense as something like kale or collard greens. Plus, I think it’s pretty. Toast the coconut in a large pan, then remove and reserve. Heat a little olive oil in the same pan and add the mustard seeds and red pepper flakes and cook until they start to toast/pop. Add the onions and apples and saute until the onion is softened and just starting to turn golden. Add the garlic, ginger, and dried cranberries. Saute until fragrant (about a minute). Add the chopped greens and toss to coat and then allow to wilt (if you are making this for a large number of people I suggest wilting the greens in batches first and then allowing them to drain while you sauté the onions/apples and then return the greens to the pan at this stage). Add the lemon juice (to taste), coconut and season with salt/pepper. Toss to coat and serve immediately. Maybe the reason I (sort of) like polenta but not grits is due to the chicken stock, butter, and/or parmesan or other flavourings. Somehow grits makes me think that food is not supposed to be so white. I think you’ve been eating the wrong kind of grits. In my experience all bowls of grits with a small lake of butter on top. I’m now tempted to make you grits one year just to see if I can change your mind about them.